Sensory- Friendly Movies Now a Reality! Sensory-Friendly Movies are designed to minimize adverse sensory experiences and maximize enjoyment. Low lights are left on during the show, sound volume is reduced, and film previews are left out. Children can move around and make noise, allowing them the freedom to enjoy the movies without social limitations to hamper their experience. Truly, the autism-friendly cinema or sensory-friendly movie is an innovative approach to autism and the movie experience, and yet, it has been in existence only for a very short time. It was a cloudy, overcast Friday, a day before Typhoon Ondoy ravaged a lot of places in Metro Manila including Marikina, Pasig and Cainta and made history, we made a different kind of history. We woke up unusually early that day, excited and buoyant. Even Alphonse, who wakes up late most days, didn’t complain when we woke him up. "It’s your day, anak," I whispered gently to this sleeping baby, all five feet and four inches of him. He stirred a little, blinked a few times, then, jumped immediately upright like a coiled spring. Hand in hand, Alphonse and I danced happily, albeit gingerly, while I sang "I’ve Got A Feeling.” (by Black Eyed Peas). 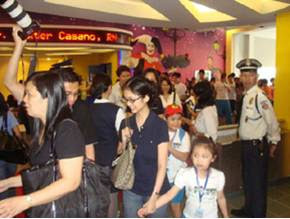 When SM Cinema 3 of The Block, North EDSA opened its doors to its patrons on Friday morning, the lines were long. 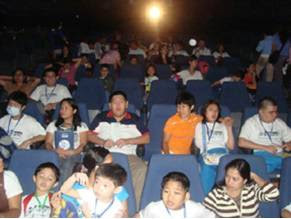 One hundred fifty (150) students from different schools and institutions Bridges, ALRES, Cradles of Learners, Immaculate Concepcion SPED, New Hope, Wise Light and Commonwealth Elementary SPED, all accompanied by their teachers, parents, or caregivers, filled the cinema lobby. Alphonse and I were also invited. Our very first movie felt like a real date! Click here to know more about the launching. I'd like to congratulate you for a beautiful work that you do with your advocacy on Autism. It's a privilege living in a country where the weak are supported, not rejected. I'd like to share with you what an article that I read in New York Times about prenatal Autism Diagnosis in the U.S. and thus eliminate them. I'm truly glad here in the Philippines, we are surrounded with so much love and acceptance.